Text + Questioning = Critical Literacy | Be Strong. Be Courageous. Be You. ← Why Get Critical About Literacy? This morning I had opportunity to be in classrooms working with 3rd and 4th-grade students on reading a visual text. (I played a video.) I was aiming to set them up to do some critical reading work. I wanted to point them in the direction of sourcing and contextualizing. Big words. Big concepts. Important work. Reading skills that are crucial to understanding the world and living in it as educated individuals. Exactly what we want to strengthen our students in doing when they read. What these eight and nine-year-olds did was amazing. Students watched this video of Pat Theriault performing Sojourner Truth’s “Ain’t I A Woman?” speech from 1851. Next they watched this version by Kerry Washington. Then they wrote down all the questions they could within 5 minutes. They talked with a partner and added to their questions. They chose one “most important” question to share with the class. They did all the work. They did all the thinking. They wrote their questions. My colleague, Emmalee Briggs who is a History major and specialist for secondary History was struck by now naturally students came to the important work of contextualizing. One of the clear ways they came to this was by having time to inquire without being given a correct answer. This is the work of historians. This is the work of thinkers. When they had talked with their partners again, I asked them to write. I gave no direction other than please write what you’re thinking. Here are a few examples of what they wrote. I learned that this topic is about slavery and how men treated women at that time. I think that this was a great topic because right now we are in historical fiction and it is about slavery, civil war, world war I II. It’s about tradjic (tragic) story’s that happend back then. So this would help us in HF (historical fiction) and just tell us like, “Look what happend then and look what happend now.” I think this was giving us tips of how to read historical fiction. Um, wow. Alex is trying to put this lesson into context in terms of her own learning. Critical literacy in action, age 9, grade 4. She thinks women should vote. Nailed it. No one ever said that. She put everything together and synthesized her thinking into this one spot-on line. MV did a lot of writing in the 7 minutes I gave the students. Why does this women seem so serouse? But I can ell she has a very clear point about this. Why do thse laydies talk about how Jesus made women and she is saying if men did no have women and if the world did not have women we would all be gone. Life would be miserable. But I can also tell that therse ladyies are very serouise because thier mad. Because women are really inportaint to this world. And these womens are sticking up to there rights. ANd what these ladys are saying is that there are a lot and a lot of things woman can do what men can do. He also charts his thinking with a Know and Wonder chart. What beautiful evidence of the teaching he has had this year. 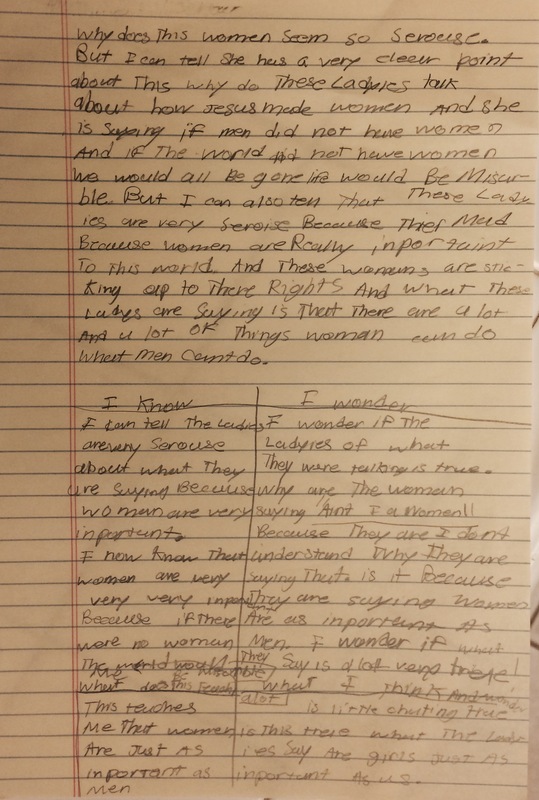 THere are many more examples of these nine year old students doing exactly this same thing, synthesizing their learning and expanding their thoughts about a topic by questioning. Thank you to my friend and colleague, Cathy Skubik for lending me her beautiful class of 4th graders today. Check out her blog, “Trench Lessons,” here. Thank you to Tara, Dana, Stacy, Beth, Betsy & Anna at Two Writing Teachers for hosting this Slice of Life March 2015 challenge. 25 days down and feeling fine. For more fine writing, check here. 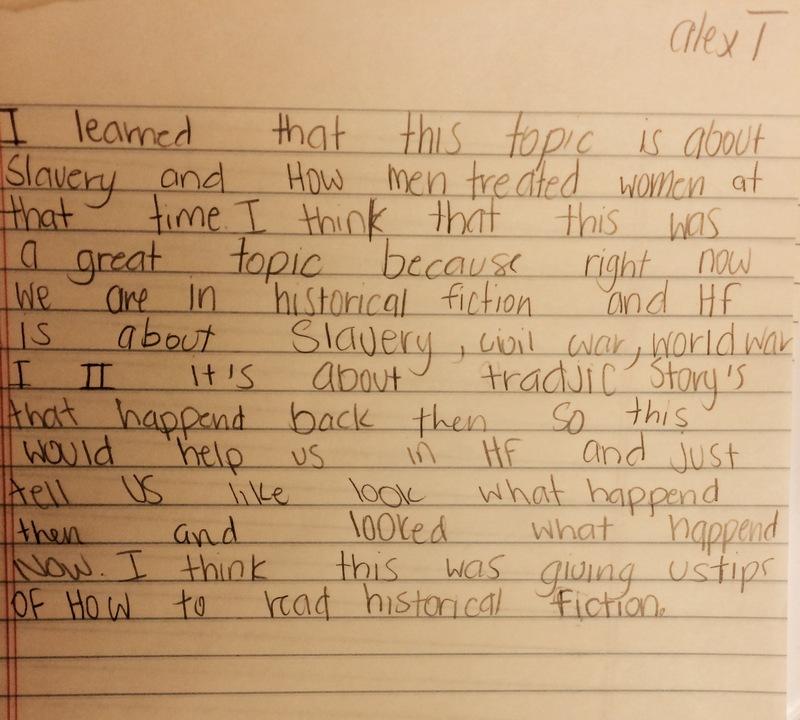 This entry was posted in History & Social Studies, paired text, SOL2015, Teaching, video text, Writing and tagged context, contextualization, Critical Literacy, History, reading, Social Studies, Sojourner Truth, SOL2015, sourcing, student writing, talk, Thinking like a Historian, Trench Lessons. Bookmark the permalink. Great lesson, Dayna, and what amazing thinking! It is incredible what kids can come up with when we give them the chance. I did similar lessons in 5th and 3rd with fascinating results and responses from kids. Lots of blog worthy material! Love this thinking! What depth and understanding by allowing the students to come up with their own questions and being able to talk to one another before writing. Powerful! Crazy wonderful when we realize we can set THEM up to discover – teacher facilitator vs font of knowledge. Good stuff! They are impressive creatures! What great minds they have. I love how you used two video clips in this lesson. Total access to text making way for all of that thinking and contextualizing ! What an incredible lesson! Thank you for sharing this. Ah, Dayna! Such a nice access route for these kiddos! Something that was totally “doable” that required viewing and thinking and then sourcing their evidence. I so loved the inclusion of the “Know/Wonder” chart – the whole point of work with graphic organizers is when do students grab on to them and use them independently!!! I am finding that students are so much more capable than we ever believed, WHEN we set them up in optimal learning environments with high expectations! BRAVO! Yes! It is so powerful when they can do the heavy lifting – inquiry is a beautiful path. Day Wells, you rule! Seriously.